Burg Eltz, or Eltz Castle, is one of the most charming castles in all of Germany. It lies in the west of Germany, between Koblenz and Trier, and is surrounded on three sides by the Moselle River. Visitors are immediately awed walking through the part in the trees and seeing the fairytale castle on a pedestal below. Guests of the castle can explore parts of the Eltz family home. This family has resided in the castle since the 12th century for an impressive 33 generations. Visitors can walk the small grounds where the castle sits on an oval rock, 70 meters above the river in a valley. The castle's unique shape follows its unusual foundation. Guided tours offer an overview of life in a castle with details like the medieval plaster, consisting of oxblood, animal hair, clay, quicklime and camphor. The castle is eight floors with eight turreted towers (at heights of 30 and 40 meters) and around 100 rooms. The oldest part of the castle, still visible today, is the Romanesque keep, Platt-Eltz, as well as four stories of former Romanesque pallas (living quarters). The design was unusual in that almost half the rooms have fireplaces so every room could be heated - quite a luxury at the time. The castle also features the oldest painted chimney in Germany. Tours finish in the kitchen with its medieval refrigerator - a cupboard cut into the cool rock face. Besides authentic medieval decor, Eltz Castle features a museum with an impressive collection of original furniture and artwork. The Knights Hall has armor dating back to the 16th century, and the original treasure vault is available to visit on your own between 09:30 and 18:00. If you are feeling peckish after a day at the castle, there is a restaurant and a castle shop for souvenirs. Besides the castle itself, there are several hiking paths in the Eltz Woods. Athletic visitors can even hike to nearby Burg Pyrmont (2.5-hour hike). Despite its many unique elements, the Eltz Castle is still a bit of an insider tip and not nearly as crowded as other castles in Germany. Eltz Castle is a masterpiece frozen in time. It was attacked only once but never taken, leaving it intact for visitors today. The castle began as a deed of donation in 1157 by Emperor Frederick I Barbarossa with Rudolf von Eltz acting as a witness. It lay in a strategic location astride the Roman trade route from the Moselle Valley and the Eifel region and was created with the cooperation of three local lords from the historical families of Kempenich, Rubenach, and Rodendorf. The first part of the construction was the Platteltz keep with the Rübenach section added in 1472. In 1490-1540 the Rodendorf section was added and in 1530 the Kempenich section was built. It is essentially three castle in one. In 1815 the separate lives of the castle were finally united under the House of the Golden Lion (the Kempenich descendants) who had outlived their fellow castle owners. 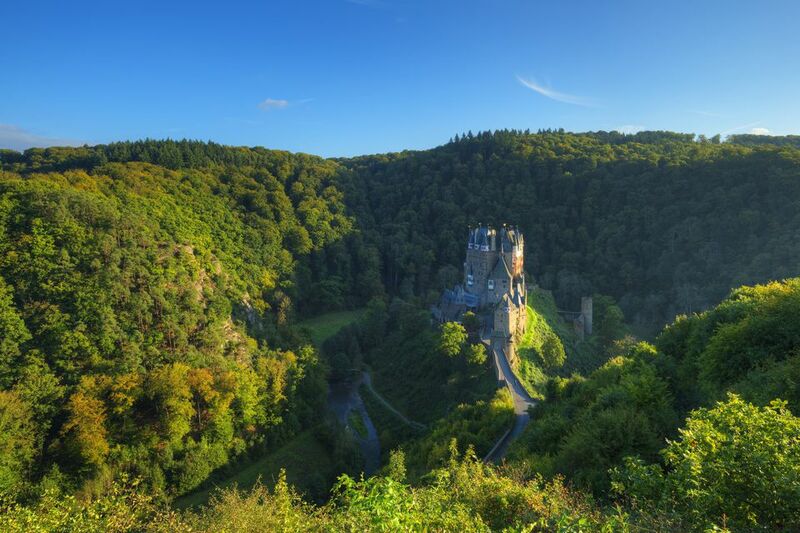 Transport: Burg Eltz is generally only accessible by car, motorbike or bus. Most travelers arrive from Münstermaifeld and Wierschem. However, a new public transport service, ÖPNB Burgenbus (Line 330), runs four times a day from May to October, only on Saturdays, Sundays and public holidays. From the parking lot, you can either walk up the hill to the castle or take a shuttle bus (€1.50). Note that photography of the rooms and chambers is verboten (forbidden).